In the men's marathon, 2 past Gold Coast Airport Marathon winners, 40+ world record holder Kenneth Mungara of Kenya and, just 2 weeks after a 50 km national record, Japan's indefatigable Yuki Kawauchi (Saitama Pref. Gov't), head to head for the last 12 km of the race. Kawauchi, with big plans for the fall, from the gun up front behind the pacers, never relenting on his front line position. Mungara, crafty, holding back in the pack of 11, holding back until Kawauchi set off in pursuit of a breakaway pacer just before 30 km. 30 km, unusually early for the always fast-closing Kawauchi to go to the front. Anyone else and Mungara, top 3 in 5 of his last 6 races including 3 wins and multiple resettings of his own 40+ WR, might have let it go. But a champ recognizes a champ. A gap from Kawauchi, and Mungara was on it. In touch by 32 km and ahead. Kawauchi closing. In contact. Physically, Mungara showing irritation at heel clipping. Side-by-side. Kawauchi ahead. Mungara ahead. A #1 sign to the crowd and surge from Mungara, matched immediately by Kawauchi. One of the fastest closers and one of the craftiest of the crafty of the sport, down to the end, to the left turn into the Gold Coast finish chute, Mungara kicking away on the curves, Kawauchi closing in the straight. Mungara, 42, with the win in 2:09:00, Kawauchi a second behind in 2:09:01 in his first sub-2:10 in over a year and a half. Mungara, the first man in almost 20 years to win back-to-back Gold Coast titles. Kawauchi, the first Japanese man ever to run sub-2:10 outside Japan lthree times in his career. Race director Cam Hart: "With no disrespect at all to Rob De Castella's Commonwealth Games win, this was the greatest race on Australian soil." Mungara hopes to return next year for a third-straight win. Kawauchi's next marathon comes in September at the Berlin Marathon where he hopes to run 2:07, followed by a shot at the Porto Marathon course record in November. And in the women's race. From the start, 2:23 Ethiopians Gulume Chala, the 2015 Frankfurt Marathon winner, and Meseret Biru, the 2015 Paris Marathon winner, and little-known Japanese also-ran Misato Horie (Noritz), on course record pace steadily sub-2:27. Horie, uncharacteristically confident for a Japanese athlete pre-race, despite a 4-minute difference in PB saying, "There's nobody here I can't beat." Horie, applying the pressure, cracking Biru to the point she DNFd, cracking Chala, alone after 33 km, sailing on alone, under the sun, Yukiko Akaba's 2:27:17 course record never out of range. Alone in the chute. Alone in the home straight. Alone across the line in 2:26:40, the fifth Japanese woman in a row to win on the Gold Coast. "I never thought of myself as someone who could compete with Africans or break the course record," Horie said post-race. "This was an incredible confidence builder. I think I can make the London World Championships team." To reach that end Horie plans to run her next marathon at one of the upcoming winter domestic Japanese selection races, Saitama, Osaka and Nagoya. Mungara wasn't the only one to push barriers. In 3rd in the men's race, 41-year-old Moroccan-born Belgian Abdelhadi El Hachimi, outkicking Japan's Chiharu Takada (JR Higashi Nihon) with a 2-minute PB of 2:10:35 for 3rd. 40-year-old Katie Kemp of New Zealand with a PB of 2:40:05 for 7th in the women's race. 15-year-old Katrina Robinson of Australia debuting in the 10 km in 34:27. 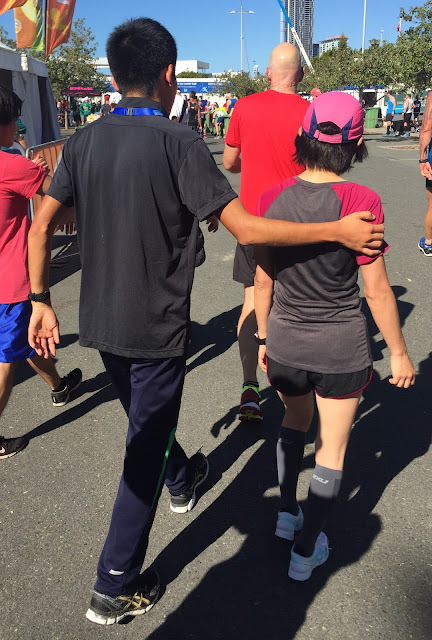 And, in the marathon, Kawauchi's mother, Mika Kawauchi, his childhood coach, running the marathon for the first time at age 52, clearing her sub-4 goal with ease in 3:53:53, 3:48:39 on net time, her son there to meet her and hold her up at the finish. Is there a record for mother and son in one marathon? "The training she put me through when I was young was harsh, but I'm here today because of that," Kawauchi said post-race. A 42-year-old former barber and a civil servant, two of the men farthest outside the box in the sport today. An unknown smacking down two far more accomplished Africans in course record time. Mother following son. One for the ages. Love it - Kawauchi's mother's race was the best run of the day. And well, can't forget Yoko Shibui in 5th, who's no youngster. Fantastique ! Amazing Kawauchi ! Must be his 9th time offially under 2h10' (actually his 10th time, when he ran 2h10'01 at Gold Coast Marathon in 2013 he didn't sart on the front line and his net time was 2h09'58. You'll be delighted to know, Anna, that when she had to do an interview on the broadcast within about a minute of finishing she turned to me and asked, "髪の毛大丈夫？" "Is my hair okay?" On a day that saw the fastest Boston Marathon men's winning time in 8 years and one of the deepest races in history with ten men under 2:10 including two Americans, the strongest-ever Japanese men's contingent at Boston couldn't live up to the level of the day. 2018 Jakarta Asian Games gold medalist Hiroto Inoue lasted the longest, running solidly in the lead pack well into the Newton hills and looking comfortable until he didn't. Inoue ended up 12th in 2:11:53, just missing a top 10 placing that would have put him clear of the 2020 Olympic qualifying standards ahead of September's MGC Race Olympic trials. Defending champ Yuki Kawauchi fell off early, dropping at one point to 5th among the five elite Japanese men in the field but rallying late in the race to take 17th in 2:15:29, 29 seconds faster than his winning time last year. Kawauchi ran down Hayato Sonoda in the home straight, Sonoda next across the line behind him in 2:15:58.